There is a set of doors in the ITER Tokamak Building that makes one feel like Gulliver in Brobdingnag, the land of the giants in Jonathan Swift's novel. Massive in dimension and weight, the doors require a custom-made handling tool for installation. The leaf mounting tool is one-of-a-kind—created by contractor Cegelec/Sommer to move the massive port cell doors to the concrete pouring station and back to their final installation locations. Coloured in bright red and sitting on eight yellow double wheels, the tool is equipped with two large holding frames that clutch the port cell door like a sandwich. Extending out radially from the concrete bioshield—like so many spokes around a central hub—are nine-metre-long chambers called port cells. The trapeze-shaped spaces will accommodate heating pipes, electricity cables, diagnostic lines and maintenance systems as they pass through to the vacuum vessel from outlying galleries. The port cells also have a part to play in shielding workers and the environment from radiation. This model shows the neutron flux within the Tokamak Building with the highest levels in red and the lowest in blue. The confinement properties of the port cell doors (the white lines forming a circle) are clearly illustrated. At the far end of each port cell (relative to the machine) are heavy nuclear doors that act as a confinement barrier preventing neutrons and potential contamination from passing through. Forty-six nuclear doors will be necessary to close off the same number of port cells. Made of steel, the doors are 4.2 meters wide, 3.8 meters high and 0.8 meters thick. 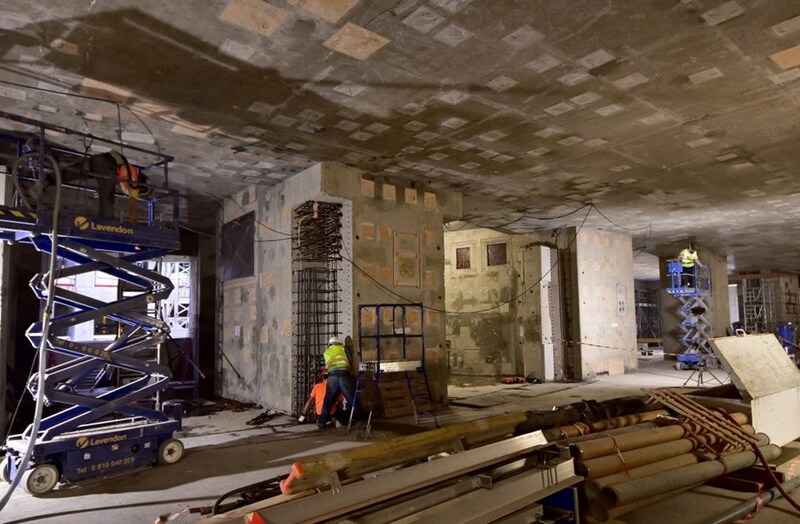 Delivered hollow, they will be filled on site with approximately 7.5 cubic metres of special heavy concrete that—when poured into each door—increases their weight from 30 tonnes to roughly 60 tonnes each. 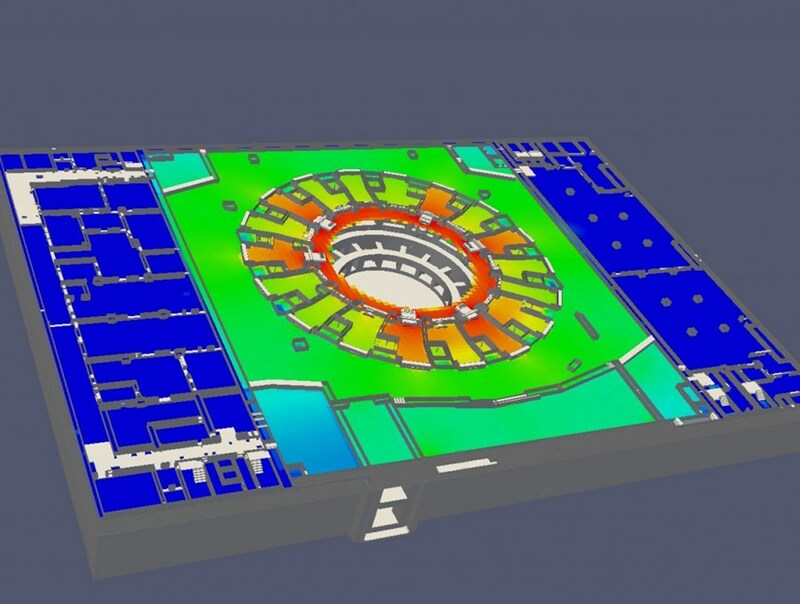 The French-German engineering consortium Cegelec/Sommer, subcontractor to the European consortium VFR that is in charge of the construction of the Tokamak Complex, is manufacturing the nuclear doors. Cegelec/Sommer has also developed a custom-made lifting device called the "leaf mounting tool." 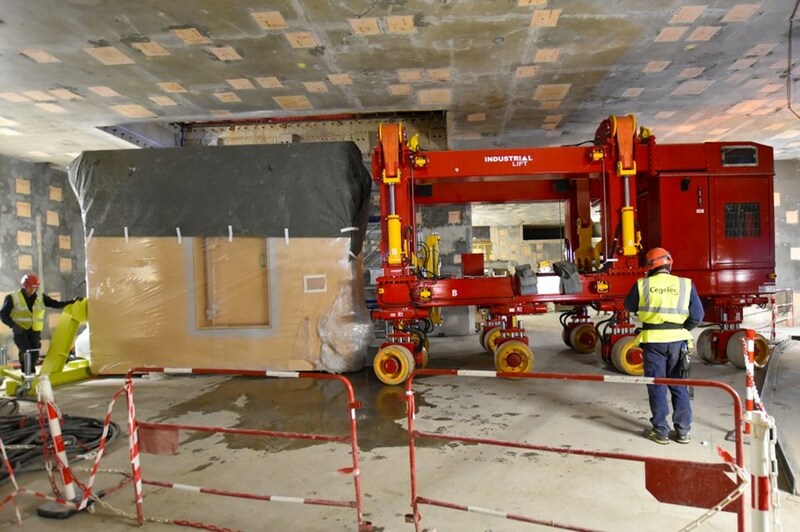 Built to precise ITER specifications, this heavy-duty machine is capable of maneuvering the massive port cell doors within the confined space of the Tokamak Building. Port cells connect the bioshield wall to the outlying galleries. In the two port cells visible here, work is either underway (left) or completed (right) on the hinge and lock supports for the nuclear doors. The machine's hydraulically adjustable lifting straps lift each door off the ground by a few centimeters and hold it in place between the tool's steel frames, while the tool travels to the concrete filling station and back. Eighteen doors will be fitted into three-piece steel doorframes at B1 (upper basement) level, and 14 each on levels L1 (ground level) and L2 of the Tokamak Building. Once mounted, the port cell doors will remain closed, only to be opened for machine assembly or future maintenance activities. For operators to have easy routine access to the port cells, regular-sized "personnel access doors" are fitted into the centre of each port cell door. Sixteen port cell doors have been delivered, and seven have already been filled with heavy concrete. Teams are ready to begin installing the port cell doors into their frames—an activity that will last until mid-2020.